There’s no denying that having your very own water dispenser with fresh, clean water in your home can help to improve your water intake. This crock holder stand has been built to hold both a crock pot and water jug so that your family can enjoy clear water all year round. At 27 inches high, it’s ideal for just about any room of your house or office and provides a stable base to keep a quality ceramic crock and water jug. Built to fit almost all styles of jugs, it’s a truly versatile product that won’t limit your style. 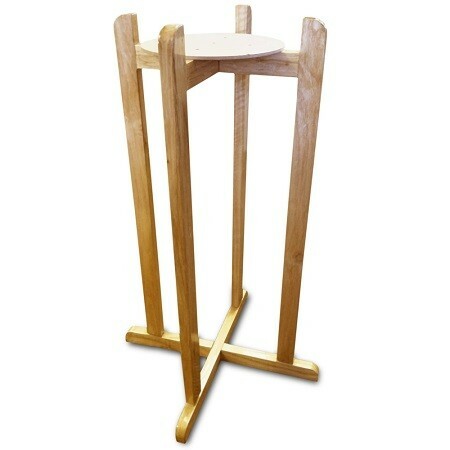 Crafted from durable hardwood, this crock holder stand can tall in any room of the house, and even features levelers for its feet in case of uneven surfaces. The stunning blue finish will match any décor amazingly, and offers a warm and friendly accessory for your home. 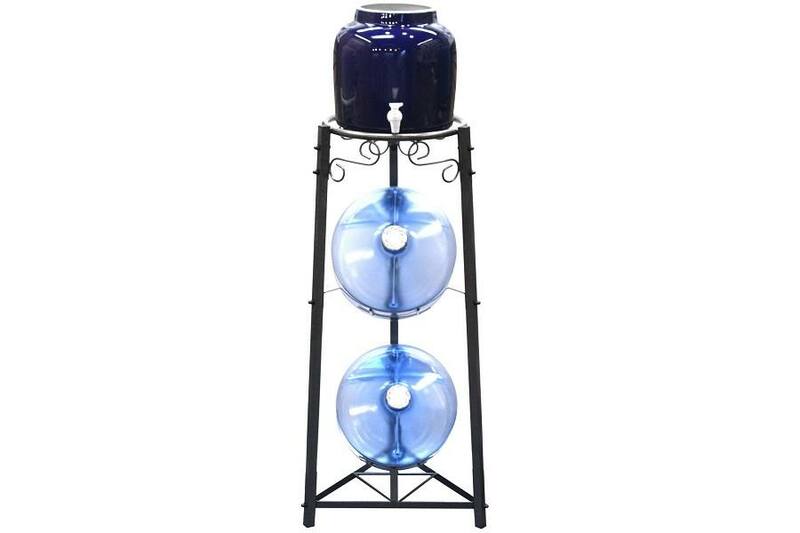 Designed to be sturdy and durable, this blue ceramic crock holder stand can withstand serious weight to provide you and your family with a base for your water jug. When you’re not using it at home, you can even take it along to parties and picnics as a great way to serve up ice cold drinks. The options really are endless with this gorgeous crock holder stand. 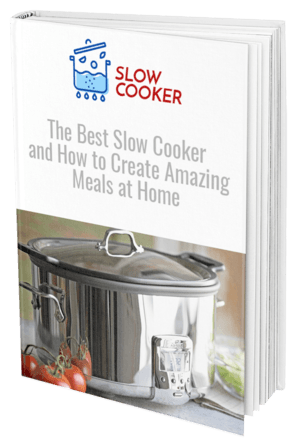 Designed to be a universal crock pot holder so there’s no need to purchase one specific style or brand to have it fit. At 27 inches high it can be placed just about anywhere, without needing to find room on your kitchen countertop to fit it in. Has unique, adjustable feet so it won’t become unstable if placed on an uneven surface. Although advertised as blue, the manufacturer states that the style and color of this crockpot may differ for each shipment. Weighing around 10 pounds it can be a little heavy to carry, but the weight helps add to its sturdiness if on an uneven surface. The Blue Ceramic Crock Holder Stand is a gorgeous way to serve up fresh, sparkling water to your family and help bring some health into your house. With something as fun and inviting as this hardwood stand, it’ll be easy to entice your children into drinking more water each day. 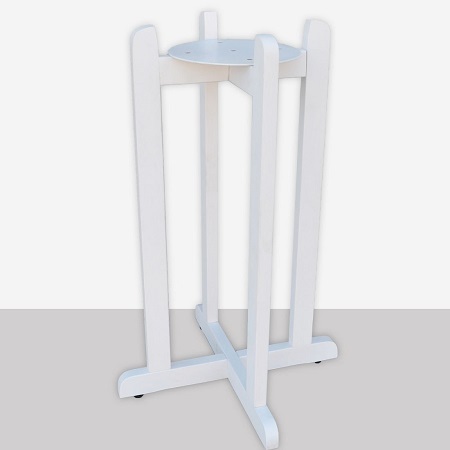 At 27 inches tall, it’s the ideal height to place just about anywhere around the home but is a little on the heavy side at 10 pounds for just the frame. However, when you add a ceramic crock to this and water bottle, you’re guaranteed that nobody will be able to move it and cause an accident. There is a slight risk that the product you order may not match the blue as advertised, however the manufacturer is direct about this. Considering the fair price tag for such quality hardwood construction, it seems a small risk to take, though. To add a touch of sophistication and health to your home or office, purchase the Blue Ceramic Crock Holder Stand today.